Back in 2016 Jacob and Bo decided to create a new sparkling beverage meant to be enjoyed on its own or paired with food, called Sparkling Tea. 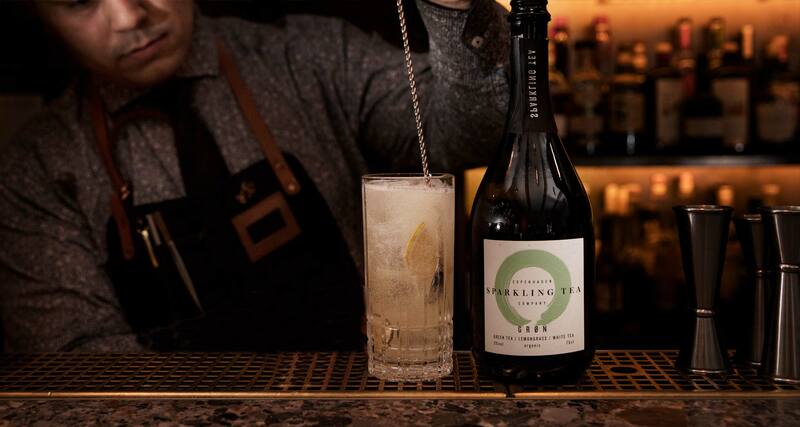 However, a year later, an eccentric autodidact mixologist and bar manager, Christian Tang, started using sparkling tea with the whole new purpose of elevating the cocktail experience. Accompanied by his unique selection of spirits and self-made syrups he proved an unseen potential in our Sparkling Tea. While opening our eyes for new possibilities, he simultaneously emphasized the strength of Sparkling Tea, which we pride ourselves with everyday – namely the unique complexity and deep dry character of Sparkling Tea, which is exactly what makes it an incredible ingredient for cocktails. 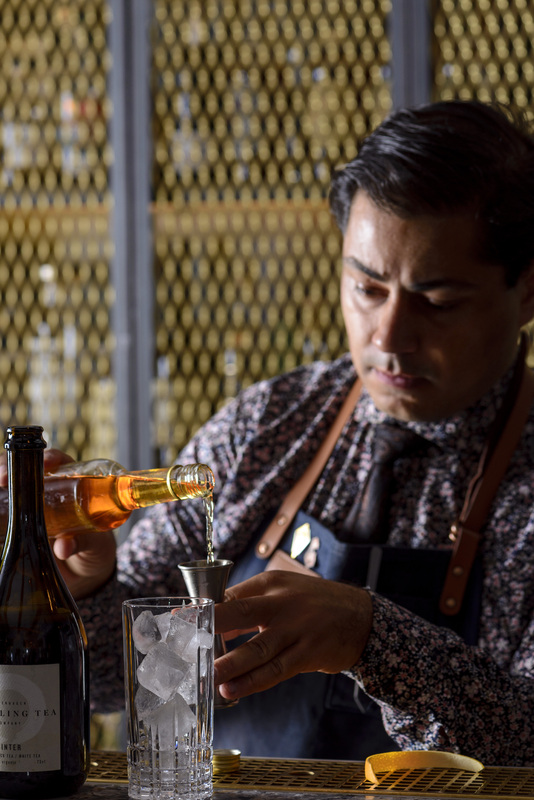 Christian has a background in IT, which somehow makes sense, when you see his nerdy and detailed approach to drinks, where he delves into the chemistry behind the textures and combinations of the ingredients in his drinks. Latest he just opened his own cocktail bar with a serious speakeasy vibe. Here a part of the interior is of course a rotary evaporator, where he experiments and creates a variety of interesting home brewed spirits. Had you asked Christian 5 years ago he probably could’ve predicted the rapid success of the no/low-alcohol trend, being one of the first in Denmark to take in Seedlip – the now multinational alcohol free spirits brand. When he back in 2017 introduced us to the combination of Seedlip and Sparkling Tea BLÅ (0%alc) along with a few splashes of other ingredients, he made it clear that a drink is not defined by the alcohol content, but rather the taste, quality and symbiosis of ingredients. One of the strengths at his current Copenhagen Cocktail bar, Kyros&Co., where he puts just as much of his nerdy heart into the non-alcoholic as the alcoholic drinks..
And if you don’t have the possibility of passing by his bar, then you can try and copy Christian with your own Sparkling Tea cocktail. Recipes here.